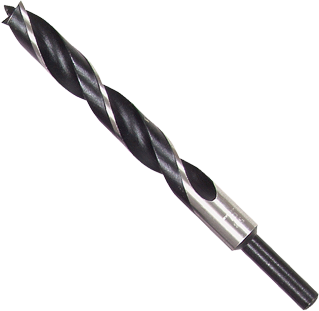 Bosch offers a complete line of wood boring bits for heavy duty and fine woodworking applications. Brad Point bits from Bosch are made to deliver accurate, clean holes every time with faster boring action. Other wood boring bits offered include spade bits, self-feed bits, bellhanger bits, forstner bits, and hinge boring bits. B14601 1/8" 1/8" 2.75 1-5/8"
B14602 3/16" 3/16" 3.5 2-5/16"
B14603 1/4" 1/4" 3.3125 2-1/4"
B14604 5/16" 5/16" 4.4375 2-3/4"
B14605 3/8" 5/16" 5.1875 3-1/4"
B14606 7/16" 5/16" 5.5625 3-1/2"
B14607 1/2" 5/16" 5.9375 3-1/2"